Berlin will be the next European city that will ban traffic for diesel vehicles. That’s what the judges decided last Tuesday. Diesel restrictions are already in force in several German cities. Some of them introduced them themselves, others ordered the court. On Tuesday, October 9, a similar verdict was made at the Administrative Court in Berlin. The capital of Germany will have to introduce prohibitions for diesel vehicles on the 11 most-frequented sections of roads. By the end of March, the city has time to tighten the air cleanliness plan by issuing appropriate regulations. Restrictions will apply by the end of June 2019 at the latest. Both passenger cars and trucks with diesel engines that meet the emissions standard from EURO 1 to EURO 5 will not e able to drive on the sections of the road covered by the ban. 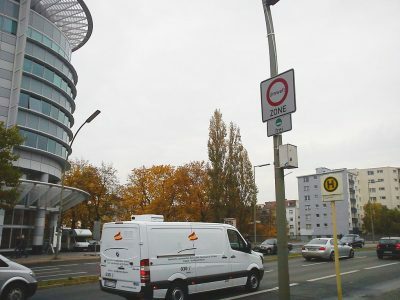 Vehicles with high emission standard will not be able to navigate the main streets of Berlin, such as Leipziger Straße and Friedrichstraße. The Berlin authorities will decide what will be the further sections with a total length of 15 km. They will also check whether there will be a need to extend the ban also for vehicles complying with the EURO 6 standard. The verdict is not yet final.